Using advanced dynamic imaging, researchers have been able to visualise deformation (sound) waves in crystals and measured the effect on nanomagnetic elements. This offers new low power magnetization manipulation for memory or logic applications and the methodology offers a new approach for analysing dynamic strains in other research fields: nanoparticles, chemical reactions, crystallography, etc. One way to produce rapid (i.e. subnanosecond scale) changes of strain and, thus, induce magnetization changes is by using surface acoustic waves (SAWs), which are deformation (strain) waves. Now, imagine an iron rod being hammered in one side. When the rod is hit, a sound wave propagates the deformation along it. Similarly, a surface acoustic wave propagates a deformation, but only in the surface layer, similarly to waves in the ocean. In certain materials (piezoelectrics), which expand or contract when applying a voltage, SAWs can be generated through oscillating electric fields. 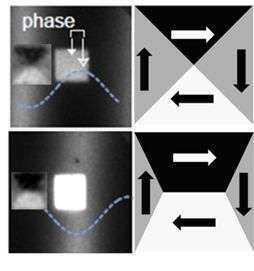 In a collaboration with groups from Spain, Switzerland and Berlin, the group of M. Kläui at JGU has used a new experimental technique to quantitatively image these SAW and demonstrate that they can be used to switch the magnetization in nanoscale magnetic elements (the "surfers") on top of the crystal. Results showed that the magnetic squares changed their properties under the effect of SAWs, growing or shrinking the magnetic domains depending on the phase of the SAW. Interestingly, the deformation did not occur instantaneously and the observed delay (see Figure 1) could be modelled. Understanding how the magnetic properties can be modified on a fast time scale is key to design low power magnetic devices in the future. "For highly complex measurements, close international cooperation with leading groups and a strong Alumni network are a strategical advantage. We have teamed up with a group from the Synchrotron Radiation Source ALBA in Spain where a former PhD student from our group is working and leading this project. The work was carried out also in conjunction with a PhD student from the MAINZ Graduate School of Excellence and it is great to see that our students and alumni are so successful." emphasized Professor Mathias Kläui of the JGU Institute of Physics, who is also Director of MAINZ.